A Palestinian civilian was wounded during Kafer Qaddoum weekly protest, northeast of Qalqiliya. Israeli forces conducted 85 incursions into Palestinian communities in the West Bank and a limited one into the Southern Gaza Strip. 75 civilians, including 12 children and 3 journalists, were arrested in the West Bank. Villages of Northwest Jerusalem were declared as a closed military zone, and 60,000 Palestinians were besieged inside. 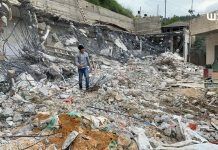 Israeli forces demolished a workshop for stone manufacturing. Israeli forces demolished a car wash and 2 barracks for grazing sheep in Deir Ballout village, west of Salfit. 7 Shooting incidents were documented against Palestinian fishing boats in the northern Gaza Strip. No casualties were reported. 6 Palestinian civilians, including a girl, were arrested at the checkpoints in the West Bank. Israeli violations of international law and international humanitarian law in the oPt continued during the reporting period (20 – 27 September 2017). During the reporting period, on 22 September 2017, Israeli forces wounded a Palestinian civilian with a rubber-coated metal bullet when they opened fire at dozens of Palestinians and international activists during Kafr Qaddoum weekly protest, northeast of Qalqiliya. On 24 September 2017, Israeli gunboats sporadically opened fire at the Palestinian fishing boats, west of al-Soudaniya , west of Jabalia in the northern Gaza Strip, and chased them. The gunboats recurred the same shooting twice on 26 September while no casualties were reported in all the incidents. However, the fishermen were forced to flee for fear of being wounded, arrested or their boats being damaged. During the reporting period, Israeli forces conducted at least 85 military incursions into Palestinian communities in the West Bank. During these incursions, Israeli forces arrested at least 75 Palestinian civilians, including 12 children. Among those arrested during this week was journalist ‘Abdel Rahman ‘Awad, Reporter of Safa News Agency in Ramallah and al-Bireh. He was arrested from his family house in Budrus village, west of Ramallah, and Raghid Tabasiyah (26), who is also a photojournalist at Annajah Satellite Channel in Nablus, was arrested as well from his family house in Qalqiliya. The Israeli forces also arrested ‘Alaa’ Badarnah, a photojournalist at the German News Agency while covering the weekly protest in the Northern Jordan Valley and took him to “Samra” settlement. After two hours, he was released. Following the armed attack at the entrance to “Har Adar” settlement, northwest of Jerusalem, on 26 September 2017, the Israeli Prime Minister Benyamin Netanyahu, threated, “the Attacker’s house would be demolished and Israeli work permits withdrawn from his extended family.” As soon as the attacker was identified, the Israeli forces declared Beit Sorik village, where the attacker lived, as a closed military zone and imposed a tightened cordon on it. Israeli forces also prevented any vehicle, civilian, ambulances and journalists from entering or leaving the village. They also closed the Tunnel Road, which is the only one connecting the villages of Northwest Jerusalem and its surroundings. The cordon has not been so far lifted. On 07 September 2017, a group of settlers from “Rahlim” settlement established on the lands of Yitma and al-Sawiyah villages, south of Nablus, cut down 43 olive trees with automatic saws. Those trees belong to Gom’ah ‘Aadi from al-Sawiyah. At approximately 00:00, Israeli forces moved into ‘Aydeh refugee camp, north of Bethlehem. They raided and searched several houses after which they arrested 4 civilians namely Malek al-Debes, Saloum al-Debes, Ehab Nayef Zaboun, and Ahmed Hatem. At approximately 00:30, Israeli forces moved into al-Jalazoun refugee camp, north of Ramallah. They raided and searched a house belonging to Ehab Walid Hmedat (27) and then arrested him. Around the same time, Israeli forces moved into Kafer ‘Ein village, northwest of Ramallah. They raided and searched a house belonging to Laith Emad Abu Kharmah (17) and then arrested him. At approximately 01:00, Israeli forces moved into Yatta, south of Hebron, and stationed in Roq’ah neighbourhood. They raided and searched a house belonging to Eyad Mahmoud Rashid (32) and then arrested him. At approximately 01:30, Israeli forces moved into Balata refugee camp, east of Nablus. They raided and searched a number of houses and then arrested 5 civilians from al-Najmi family in the centre of the camp. The arrestees were identified as Yazan ‘Ali Mahmoud al-Najmi (25) Haitham Fahed Najem (24), his brother Mo’atasem (26), and Yusuf Ghazi al-Sa’oudi (27). Around the same time, Israeli forces moved into ‘Asker al-Jadeed refugee camp, northeast of Nablus. They raided and searched a house belonging to Yasin Saber Husain Habroun (30) and then arrested him. At approximately 02:30, Israeli forces moved into Beit Ummer village, north of Hebron, and stationed in al-Qarnah neighbourhood. They raided and searched a house belonging to Mojahed ‘Ali ‘Awad (27) and then handed him a summons to refer to the Israeli Intelligence Service in “Gush Etzion” settlement complex, south of Bethlehem. Around the same time, Israeli forces moved into Jawhar Mount neighbourhood in Hebron. They raided and searched a house belonging to Noor Abdul Haleem Qafishah (24). They handed him a summons to refer to the Israeli Intelligence service in “Gush Etzion” settlement complex, south of Bethlehem. At approximately 15:00, an Israeli infantry unit moved into al-Sheikh neighbourhood in Hebron. They patrolled in groups between houses. When the soldiers arrived at the area where people were welcoming Mohammed Isma’il al-Qawasmeh, who was released after serving 14 years of imprisonment in the Israeli jails, they randomly fired sound bombs and tear gas canisters at the civilians. As a result, a number of civilians suffered tear gas inhalation. Following that, the soldiers headed to Bab al-Zawwiyah area in the centre of the city and randomly fired tear gas canisters, but none was thrown with stones. The soldiers continued to patrol until arriving at al-Malek Faisel Street and Ebn Rushd Intersection. They attempted to raid some commercial buildings, but the security guards of those buildings prevented them because of the huge number of residents in them. Meanwhile, Palestinian police officers attempted to stop the soldiers from moving forward to the market that was full of shoppers. However, the soldiers refused and continued firing sound bombs and tear gas canisters in addition to raiding some shops. They also detained some civilians and checked their IDs. They then arrested 3 civilians; two were arrested from the street while the third was arrested from his father’s workshop. After that, civilians attempted to ban the military vehicles that were carrying the 3 arrestees from moving in an attempt to release them, but they couldn’t because of being at gunpoint. The arrestees were identified as Baraa’ Sa’di Abu ‘Aishah, Abdul Salam Hejazi, and Mohammed Najib al-‘Ouwaiwi. Note: During the aforementioned day, Israeli forces conducted (4) incursions in the following areas and no arrests were reported: Jenin refugee camp, north of the west Bank; Dura, Emrish and Traqumiya villages in Hebron. At approximately 00:00, Israeli forces moved into Joyous village, northeast of Qalqiliyah. They raided and searched several houses and then arrested 3 civilians namely Ezzedin Bader Shamasneh (18), Amir E’timad Nufel (20), and Fahed Saqer Shamasneh (20). At approximately 10:20, Israeli gunboats stationed offshore, northwest of Beit Lahia village in the northern Gaza Strip, opened fire at Palestinian fishing boats sailing within 2 nautical miles and chased them. As a result, the fishermen were forced to flee fearing for their lives. The shooting continued for 15 minutes, but neither casualties nor material damage was reported. Note: During the aforementioned day, Israeli forces conducted (4) incursions in the following areas and no arrests were reported: Yatta, al-Shuyoukh, Deir Samet and al-Kume villages in Hebron. At approximately 01:00, Israeli forces moved into al-Dheisheh refugee camp, south of Bethlehem. They raided and searched a house belonging to Saleh Ahmed al-Ja’edi (25) and then arrested him. At approximately 01:30, Israeli forces moved into al-Dawhah village, west of Bethlehem. They raided and searched a house belonging to Wael Abu Sawi (23) and then arrested him. At approximately 02:00, Israeli forces moved into Nablus. They raided and searched a house belonging to Ahmed Mohammed Drouzah (21), student at An-Najah National University in the city, and then arrested him. At approximately 03:00, Israeli forces moved into Hebron, and stationed in al-Selah neighbourhood. They raided and searched a house belonging to Yahiya ‘Ali Naser Eden (25) and then arrested him. Note: During the aforementioned day, Israeli forces conducted (3) incursions in the following areas and no arrests were reported: Bani Na’im village and al-Fawar refugee camp in Hebron, Turah village, adjacent to the annexation wall, southwest of Jenin. At approximately 01:30, Israeli forces moved into Bethlehem. They raided and searched 2 houses belonging to Mahmoud al-Shuweiki (20) and Amin Abdullah Abu ‘Aahour (22). The soldiers then handed them 2 summonses to refer to the Israeli Intelligence Service in “Gush Etzion” settlement complex, south of the city. At approximately 16:00, an Israeli infantry unit moved into Bab al-Zawiyah area in the centre of Hebron. They deployed among shops and patrolled the streets. As a result, civilians, who were in the market, panicked. After that, a number of youngsters threw stones at the soldiers. The soldiers then fired sound bombs and tear gas canisters at the centre of the market and then chased the youngsters. The Israeli forces arrested 2 children namely Salim Mohammed Salim Samouh (14) and Hamdi Khalil al-Qawasmeh (14). Note: During the aforementioned day, Israeli forces conducted (3) incursions in the following areas and no arrests were reported: ‘Aydah refugee camp, north of Bethlehem; Hebron and Raboud village. At approximately 01:00, Israeli forces moved into Beit Fajjar village, south of Bethlehem. They raided and searched a house belonging to Eslam Mohammed Deriyah (25) and then arrested him. Around the same time, Israeli forces moved into Marah Rabah village, south of Bethlehem. They raided and searched a house belonging to Walid Mahmoud al-Sheikh (27) and then arrested him. At approximately 01:30, Israeli forces moved into Taqqou’ village, east of Bethlehem. They raided and searched 2 houses belonging to Mohammed Rebhi al-‘Amour (220 and Omer Hammad Hmaid (19) and then arrested them. Around the same time, Israeli forces moved into Qalqiliyah. They raided and searched 2 houses belonging to Mahmoud Sobhi ‘Edwan (24) and Raghid Mohammed Tabsiyah (26) and then arrested them. It should be noted that Tabsiyah is a photojournalist at An-Najah TV Channel in Nablus. At approximately 02:00, Israeli forces moved into Deir Samet village, southwest of Dura, southwest of Hebron. They raided and searched a house belonging to Raslan Rezeq Masalmah (24) and then arrested him. At approximately 06:00, Israeli forces moved into Joyous village, northeast of Qalqiliyah. They raided and searched several houses after which they arrested 4 civilians namely Tareq Abdul Rahim Kharisheh (26), Ahmed Abdul Rahim Kharisheh (19), Farid Sharif Qadoumi (19), and Adham Ashraf Saleh Nofel (19). At approximately 08:00, Israeli forces accompanied with a number of heavy military vehicles moved about 100 meters into the east of Khuza’ah village, east of Khan Yunis in the southern Gaza Strip. They leveled the lands along the border fence between the Gaza Strip and Israel. The Israeli forces then moved into the southeast of al-Fukhari. The incursion continued for several hours before they redeployed along the abovementioned border fence. At approximately 10:05, Israeli gunboats stationed offshore, west of al-Sudaniyah area, west of Jabalia in the northern Gaza Strip, opened fire at Palestinian fishing boats sailing within 3 nautical miles and chased them. As a result, the fishermen were forced to flee fearing for their lives, but neither casualties nor material damage was reported. The attack recurred at approximately 11:10. At approximately 16:00, Israeli forces accompanied with 2 military vehicles moved into al-Thaher area, south of Beit Ummer village north of Heborn, which is surrounded by “Carmi Tsur” They raided and searched a house belonging to ‘Essa Mohammed Bahar (20) and then arrested him. Note: During the aforementioned day, Israeli forces conducted (3) incursions in the following areas and no arrests were reported: al-Samou’, al-Burj and Beit al-Roush villages in Hebron. At approximately 01:00, Israeli forces moved into Bethlehem and stationed in Shaheen Valley area in the center of the city. They raided and searched a house belonging to Anas Mohammed Nowarah (19) and then arrested him. Around the same time, Israeli forces moved into al-‘Ezzah refugee camp, north of Bethlehem. They raided and searched a house belonging to Noor Eden Kamal Da’ajnah (19) and then arrested him. Around the same time, Israeli forces moved into Yatta, south of Hebron, and stationed in al-Karmel neighborhood. They raided and searched a house belonging to Mohammed ‘Ali al-Najjar (29) and then arrested him. At approximately 01:15, Israeli forces moved into al-Dheishah refugee camp, south of Bethlehem. They raided and searched a stationary shop belonging to Jamal Ibrahim Faraj. They then fixed a military decision to close it until 17 October 2017, without clarifying the reason. At approximately 01:30, Israeli forces moved into Taqou’ village, east of Bethlehem. They raided and searched a petrol station belonging to ‘Adnan Hajahjah. They also confiscated recording devices of the surveillance cameras, but no other incidents were reported. Around the same time, Israeli forces moved into Ya’bud village, southwest of Jenin. They raided and searched a house belonging to Ezzden Taleb ‘Atatrah (26) and then arrested him. At approximately 02:00, Israeli forces moved into Laqia village, southwest of Ramallah. They raided and searched a house belonging to Mos’ab Fehmi Sabri Nassar (30) and then arrested him. Around the same time, Israeli forces moved into Jericho. They raided and searched a house belonging to Mohammed Gharib Abu Qamar (22) and then arrested him. At approximately 02:30, Israeli forces moved into al-‘Aroub refugee camp, north of Hebron. They raided and searched a number of houses and then arrested 3 civilians namely Mohammed Hasan al-Badawi (16), Abed Sa’ed Haleqawi (19), and Mohammed Ahmed al-Badawi (18). At approximately 03:00, Israeli forces accompanied with 4 military vehicles moved into Hebron, and stationed in al- Salam neighborhood. They raided and searched 2 houses belonging to Hesham Hmedan al-Shurbati (48) and Anas Mahmoud al-Jo’bah (39). The Israeli forces also handed them 2 summonses to refer to the Israeli Intelligence Service in “Gush Ezion” settlement complex, south of the city. At approximately 03:30, Israeli forces moved into Qalqiliyah. They raided and searched several houses and then arrested 3 civilians, including 2 children, namely Muhaned Omer Samhah (16), Abdul Rahman Basel Walwil (16), and his father Basel Hamdan Walwil (52). It should be noted that the Israeli forces arrested Basel after he objected on arresting his son. At approximately 06:30, Israeli gunboats stationed offshore, northwest of Beit Lahia village in the northern Gaza strip, opened fire at Palestinian fishing boats sailing within 2 nautical miles and chased them. As a result, the fishermen were forced to flee fearing for their lives. At approximately 19:40, Israeli forces moved into Joyous village, northeast of Qalqiliyah. They raided and searched several houses after which they arrested 3 children namely Omer As’ad Salim (17), Fayez Hael salim (13), and Karam Emad Nufel (13). Note: During the aforementioned day, Israeli forces conducted (4) incursions in the following areas and no arrests were reported: Bardalah and ‘Ein al-Baidaa’ villages in the northern Valleys; al-Shuyoukh and Sa’ir villages in Hebron. At approximately 01:00, Israeli forces moved into Husan village, west of Bethlehem. They raided and searched several houses after which they arrested 3 civilians namely Mustafa Yusuf Kamel (19), ‘Odai ‘Adel Shushah (21) and Mohammed Saleh Za’oul (24) . Around the same time, Israeli forces moved into ‘Aydah refugee camp, north of Bethlehem. They raided and searched several houses and then arrested 3 civilians, including 2 children, namely Omer ‘Adel Radi (17), Mustafa Rami Hammad (17), and Mohammed Raed ‘Ouwais (22). At approximately 02:00, Israeli forces moved into Budrus village, west of Ramallah. They raided and searched a house belonging to journalist Abdul Rahman Omer ‘Awad and then arrested him. Abdul Rahman’s wife, Sanaa’ Abdul Hafez, said to PCHR’s fieldworker that the Israeli soldiers violently raided the house and broke the doors. An Israeli officer introducing himself as “Captain Wesam” ordered her husband to prepare himself to be arrested. It should be noted that Abdul Rahman works as a reporter at Safa News Agency in Ramallah and al-Birah and studied at An-Najah National University in Nablus. Around the same time, Israeli forces moved into Nablus. They raided and searched 2 houses belonging to Tareq Hassan al-Kuni (30) and Rawhi Samih ‘Ouwadah (26) and then arrested them. Around the same time, Israeli forces moved into Balata refugee camp, east of Nablus. They raided and searched 2 houses belonging to Omer Mustafa Mousa Abu Lail (25) and Hasan Ismail Sharai’ah (40) and then arrested them. Around the same time, Israeli forces moved into Dura, southwest of Hebron, and stationed in Sanger area. They raided and searched a house belonging to Mohammed Sa’ed ‘Amr (25) and then arrested him. At approximately 05:10, Israeli gunboats stationed offshore, west of al-Sudaniyah area, west of Jabalia in the northern Gaza Strip, opened fire at Palestinian fishing boats sailing within 3 nautical miles and chased them. As a result, the fishermen were forced to flee fearing for their lives, but neither casualties nor material damage were reported. At approximately 09:25, Israeli gunboats stationed offshore, northwest of Beit Lahia village in the northern Gaza Strip, opened fire at Palestinian fishing boats sailing within 2 nautical miles and chased them. As a result, the fishermen were forced to flee fearing for their lives. The shooting recurred at approximately 09:45. At approximately 02:00, an Israeli infantry unit moved from “Carmi Tsur” settlement established on Palestinian confiscated lands, south of Beit Ummer village, north of Hebron, into al-Arba’in area. They raided and searched a workshop for construction and then arrested Bilal Abdul Rahman Ismail ‘Awad (17) while he was working. They claimed that he threw stones at them. The Israeli forces took Bilal to the settlement. At approximately 22:40, Israeli forces moved into ‘Azzoun village, east of Qalqiliyah. They raided and searched a house belonging to Shaddad Hesham Mustafa ‘Edwan (20) and then arrested him. Note: During the aforementioned day, Israeli forces conducted (5) incursions in the following areas and no arrests were reported: Barqin Valley, west of Jenin; Beit Awla and Taffuh villages in Hebron; Kafer al-Deek and Bruqin villages, west of Salfit. At approximately 01:00, Israeli forces moved into al-Fare’ah refugee camp, south of Tubas. They raided and searched a house belonging to Ahmed Naser Daraghmeh (18) and then arrested him. Around the same time, Israeli forces moved into Jenin refugee camp, west of Jenin. They raided and searched several houses after which they arrested 4 civilians namely Lutfi Mohammed Abu al-Naser, Ahmed Nidal al-Sa’di, Nidal Amin Hazem, and Yazid Nidal Ja’aisah. At approximately 01:30, Israeli forces moved into Husan village, west of Bethlehem. They raided and searched a house belonging to Jamil Suhair Hamamrah (22) and then arrested him. At approximately 02:30, Israeli forces moved into Tal village, south west of Nablus. They raided and searched a house belonging to Mohammed As’ad Rehan (24) and then arrested him. At approximately 09:00, Israeli forces accompanied with several military vehicles moved into the southern area in Hebron. They raided and searched a house belonging to Abdul Latif ‘Ali Abu Suneinah. They topped the house roof and handed the abovementioned civilian a military decision of their stay in the house for 24 hours for security reasons. Note: During the aforementioned day, Israeli forces conducted (10) incursions in the following areas and no arrests were reported: Nablus, Beit Wazan, Beit Eba, and Zawata villages northwest of the city; Ya’bud village, southwest of Jenin; Zabuba village, west of the city; Surif, al-Hadab Deir Ballout villages and al-Fawar refugee camp, west of Salfit. After the attacker, Nemer Mahmoud al-Jamal (37), was identified, Israeli forces announced that Beit Surik village, northwest of occupied Jerusalem, is a closed military zone and imposed a tight closure on it. The Israeli forces also closed main and sub roads leading to the village and established checkpoints at the entrances to the village. They also banned any vehicle or civilian from entering or leaving the village. Moreover, they banned the ambulances and journalists from entering the village. Furthermore, the Israeli forces closed the Tunnel Road, which is the only road that connects the villages in the northwest of Jerusalem with its surroundings. Those villages are Qatannah, Beit ‘Anan, Beit Surik, Beit Eksa, Badou, al-Qabibah, Beit Ejza, Beit Daqou and Kharb al-Lahem villages, which are all inhabited by 60, 000 civilians. In the evening hours, the Israeli forces detained dozens of cars at the Tunnel entrance to theses villages. They only allowed limited number of cars to pass after subjecting them to precise and long search. On Tuesday, 19 September 2017, Israeli forces allowed one person and on Tuesday, 26 September 2017, allowed 2 persons, who work at the General Authority of Civil Affairs (GACA) and foreigners to renew their permits. On Wednesday, 20 September 2017, Israeli authorities closed “Erez” crossing and prevented all categories form travelling, except humanitarian cases. Israeli authorities also clarified that the “Erez” crossing will be open until 01:00 and returning to the Gaza Strip will be until 15:00. On Thursday, Friday and Saturday, 21,22 and 23 September 2017, the crossing was completely closed and all categories, except lifesaving cases, were prevented from travelling through the crossing, due to the Jewish New Year. Hebron: Israeli forces established (16) checkpoints all over the city. On Wednesday, 20 September 2017, Israeli forces established 4 checkpoints at the entrances to Ethan and Taramah villages; at the southern entrance to Hebron and at the entrance to al-‘Aroub refugee camp. On Thursday, 21 September 2017, Israeli forces established 2 checkpoints at the entrances to Ethna and Samou’a villages. On Saturday, 23 September 2017, 4 checkpoints were established at the entrances to Beit ‘Awaa and Ethan villages; at the western entrance to Hebron and at the entrance to al-‘Aroub refugee camp. On Sunday, 24 September 2017, 2 similar checkpoints were established at the entrances to Karmah and Beit Ummer villages. On Monday, 25 September 2017, Israeli forces established 2 checkpoints at the entrances to al-Dahiriyia and Taramah villages. On Tuesday, 26 September 2017, 2 similar checkpoints were established at the entrance to al-Fawar refugee camp and at the eastern entrance to Dura village. Qalqiliyia: Israeli forces established (6) checkpoints all over the city. On Monday, 25 September 2017, Israeli forces established 4 checkpoints at the eastern entrance to Qalqilyia, at the intersection of “Kedumim”settlement on the main street between Qalqiliyia and Nablus, at the entrance to Amateen village, and between ‘Azoun and ‘Izbit al-Tabeeb village, east of the city. On Tuesday, 27 September 2017, Israeli forces established 2 checkpoints at the eastern entrance to Qalqilyia and at the entrance to Seer village, northeast of the city. On Thursday, 21 September 2017, Israeli forces established 3 checkpoints at the entrance to Salfit; at the entrance to Deir Balout village, west of the city; and at the entrance to Hares village, northwest of the city. On Friday, 22 September 2017, Israeli forces established 2 checkpoints between Kaful Hares and Hares villages, north of Salfit, and at the entrance to Qarawet Bani Hassan village, west of the city. On Saturday, 23 September 2017, 2 similar checkpoints were established at the entrance to Qarawet Bani Hassan village, west of Salfit; at the entrance to Deir Balout village, west of the city. On Sunday, 24 September 2017, Israeli forces established 2 checkpoints between Kaful Hares and Hares villages, north of Salfit; and at the western entrance to Hares villages, northwest of the city. At approximately 19:30 on Monday, 25 September 2017, a similar checkpoint was established at the western entrance to Hares village, northwest of the city. At approximately 20:00 on Thursday, 21 September 2017, Israeli forces established a checkpoint under the bridge of ‘Azoun village, on the main street between Qalqiliyia and Tulkarm. They searched Palestinian civilians’ vehicles and checked their IDs. They then arrested Rashid Mohamed Ameen Saleem (26) and Mahmoud ‘Aqel Bedah (34). On Friday, 22 September 2017, Israeli forces stationed at al-Karama crossing arrested ‘Alam Ameen Rayiq, from Jenin. ‘Alam was arrested while heading to Jordan in order to complete his medical treatment. At approximately 13:00 on Saturday, 23 September 2017, Israeli forces stationed at a military checkpoint established in Tal al-Ramitha neighbourhood in Hebron, arrested Ma’moun Hussain al-Natsha (19), claiming he had a knife. Ma’moun was then taken to an investigation centre in “ Kiryat ‘Arba’” settlement, east of the city. At approximately 09:00 on Tuesday, 26 September 2017, Israeli forces stationed at al-Container checkpoint, north of Bethlehem, arrested Mousa Amjad al-Titi (20), from al-‘Aroub refugee camp, north of Hebron. At approximately 16:00 on Wednesday, 27 September 2017, Israeli forces stationed at a military checkpoint in the southern area of Hebron arrested Fatmah Abu Remilah (16), claiming that she had a knife. Fatmah was then taken to an investigation center in “Kiryat ‘Arab’” settlement, east of the city.